still running away from hard choices. Should things that you did or said as a 12 year old still grab you by the gut? After 5 summers away, middle-child Taylor is not happy to be returning to the lake house where she’ll encounter Henry and Lucy and the unfinished business they all share. From the author of Since You’ve Been Gone, another story of summer transformation, recommended here. Who should you connect with before those “thousand moments are gone”? 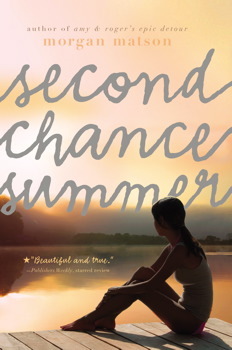 Book info: Second Chance Summer /Morgan Matson. Simon & Schuster Books for Young Readers, 2012, paperback 2013. [author site] [publisher site] Review copy and cover image courtesy of the publisher via PulseIT. My book talk: Stunned by her father’s sudden cancer diagnosis, Taylor must return to their lake house where her decisions as a tween alienated her from best friends…forever. Between her genius older brother and ballet star younger sister, Taylor feels so average. But the high school junior evidently has uncommon talent for avoiding tough emotional situations, like the ones she abandoned five years ago at the lake. Now Dad wants one last family summer together in the Poconos, to make the most of the few months he has left. Taylor knows that she’ll run into Henry (her first kiss!) 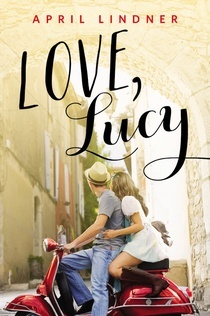 and Lucy (best friend ever, until…), but this time, there’s no running away. Who wouldn’t embrace a second chance to mend a friendship or fall back in love? What better time to appreciate parental strength and let them know it? So why is it all so hard for her? despair at losing friends and opportunities. Three young people whose lives are terribly disrupted in the turbulent years leading into World War II find comfort in playing a harmonica with magical music and unknowingly fulfill a pleasing prophecy. Find this wonderful spring 2015 release at your favorite local library or independent bookstore so that you can discover the intricate music this wonderful harmonica threads through lives that need it most. Have a story of an object that connects you to history? Please share in the comments below. 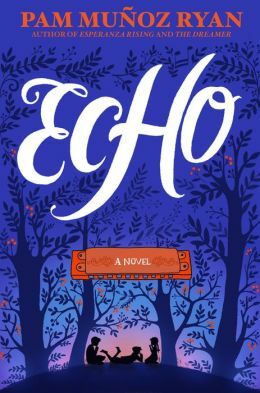 Book info: Echo / Pam Munoz Ryan. Scholastic Press, 2015. [author site] [publisher site] Review copy and cover image courtesy of the publisher. My book talk: A harmonica crafted through magic and mystery links three young people in different countries and times as they use their musical talents to overcome terrible odds. In 1933 Germany, Friedrich apprentices in the harmonica factory with his father and uncle, away from those who mock his facial birthmark and conducting of the music he’s heard. As the tide of Nazi fervor overtakes his sister, threatens free-thinkers like his father, and condemns the harmonica as uncivilized, the melodies that 12 year old Friedrich plays are a small consolation. At a Pennsylvania orphanage in 1935, Mike and little Frankie are determined to stay together. When a lawyer requests ‘musical children’ specifically, the brothers find themselves in a grand mansion whose owner wants to adopt one daughter! Tragedy took music out of Mrs. Sturbridge’s life years ago – perhaps 11 year old Mike’s practice for Hoxie’s Harmonica Band auditions can make her smile again. Ivy plays harmonica concerts for her brother Fernando before he joins the army in 1942, before Papa is hired to care for a Japanese family’s California orange groves while they are detained in internment camp. The bigger cottage is nice, but not the rundown Americanization school for Mexican children – will the fifth grader be allowed to play in the new orchestra at the main school?